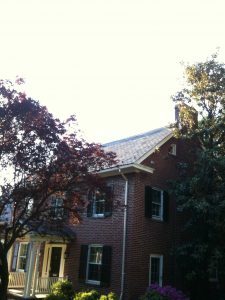 This was one of my favorite projects this spring; the existing slate roof was on it’s last leg and had been the victim of some lousy repairs over the years. 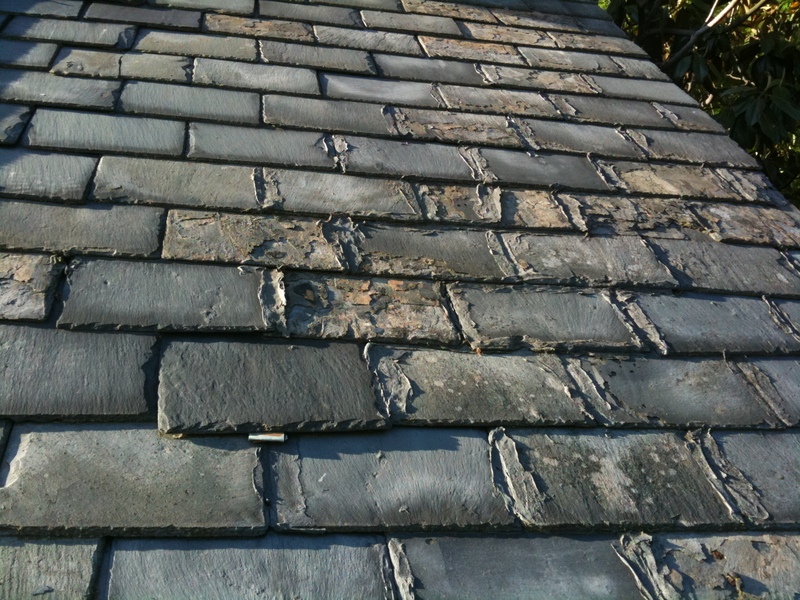 You can see where some of the slates have just turned to powder, when more than 25% of the slates have gone bad the most prudent thing to do is schedule a complete replacement. 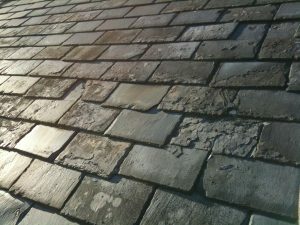 The light gray blobs between the slates is old roof cement; this was someone’s attempt to stop a leak; sealing between slate keyways will usually make the leak worse-not better. 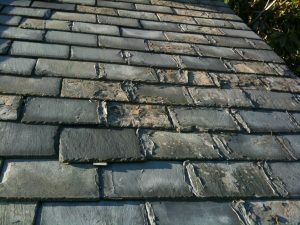 At least 60% of the existing slates have lost the will to live; some have turned to powder that hasn’t blown away yet. Tear Off: we removed all the existing slate, we checked the roof deck and made a few minor repairs. Despite the condition of slate the roof has surprisingly few leaks. First step is the installation of new 20 oz copper drip edge, this has two purposes; first it becomes our square edge to start layout, secondly it keeps water from backing up and rotting the facia and soffit. 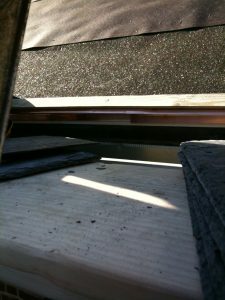 Once the drip edge is installed it pretty much disappears but its a critical part of the roof and must last as long as the slates will; hence super heavy 20 oz copper. 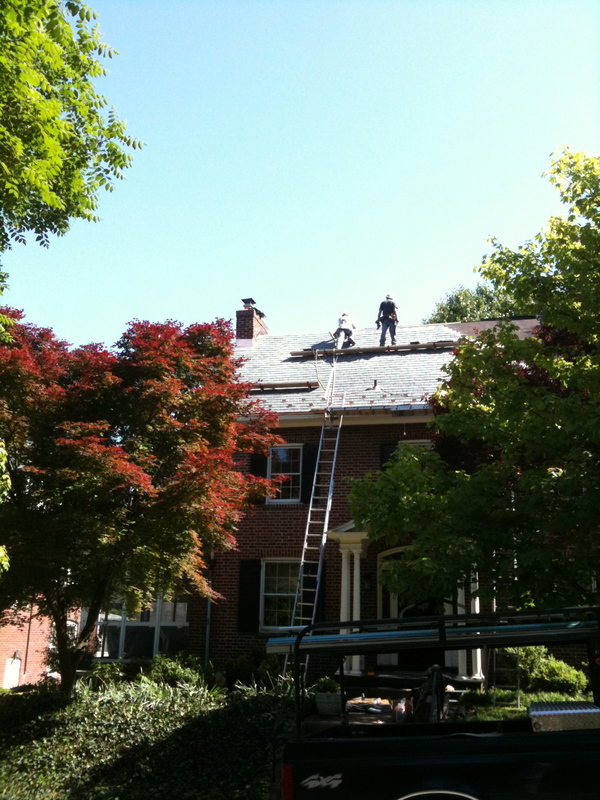 Next we installed waterproof underlayment at the eave to a point 24″ inside the warm wall of the house; this will protect the roof from ice dams. 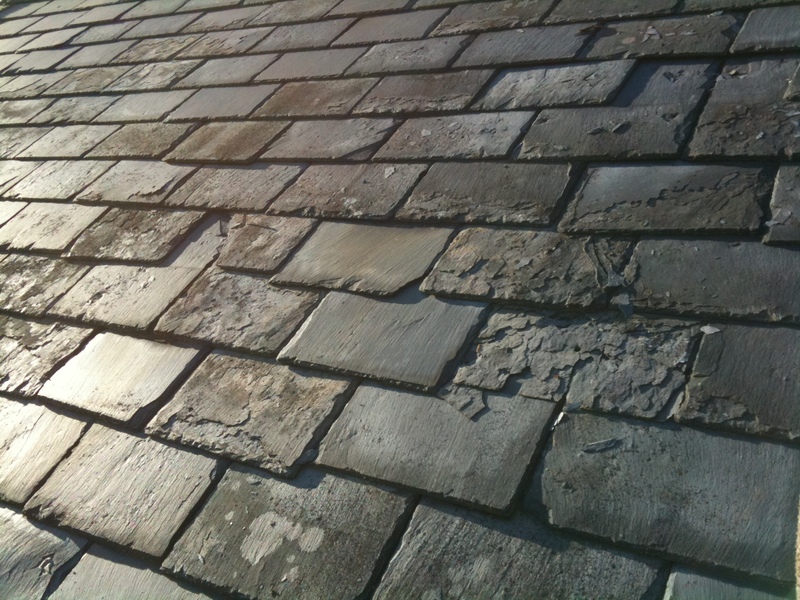 then we install two layers of 30# felt to temporarily protect the structure from rain and to give us a clean smooth surface to lay out our slates. We take a long time during layout; before any slates are installed we make sure that they line up evenly on each side of the house. Failing to perform these calculations can leave the house with full slates on the left side and little tiny slates on the right; instead of even sized slates on both sides; look at some houses; you’ll see what Im talking about. 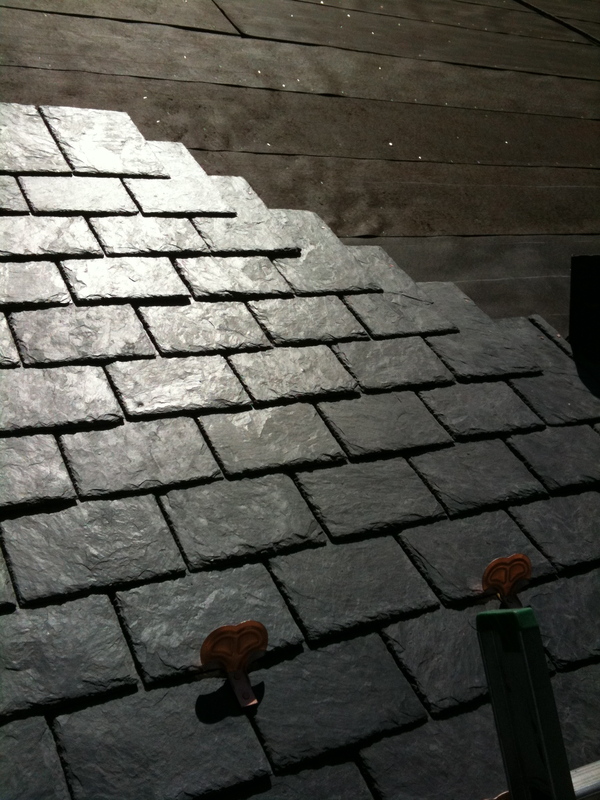 My client chose Del Carmen slate, they are quarried in western Spain and are rated S1. The S1 rating means they will have a useful life of no less than 100 years; they come in many different sizes, these are 16×10 ultra heavy. 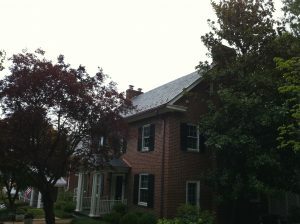 The previous roof was a thin soft slate in 24×12; I thought they were too big and looked like dinner plates on the roof. It took roughly 350 more slates of 16×10 than it would have if I installed the same 24×12’s; more slates look better, and the thicker profile of the ultra heavies give the roof a rich texture. End of day three; although the roof is very steep we made very good progress. The cloudy gray dust is slate marl (dust) that gets on the slates when the quarry cuts them in Spain, a few hours of rain will rinse it off and let the rich color come through. 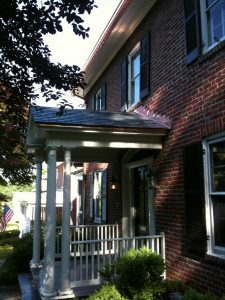 The front porch got a new roof with less obtrusive copper loop snow guards; they still keep ice from sliding off the roof but are a little less visible than the larger ones we had to use on the main roof. 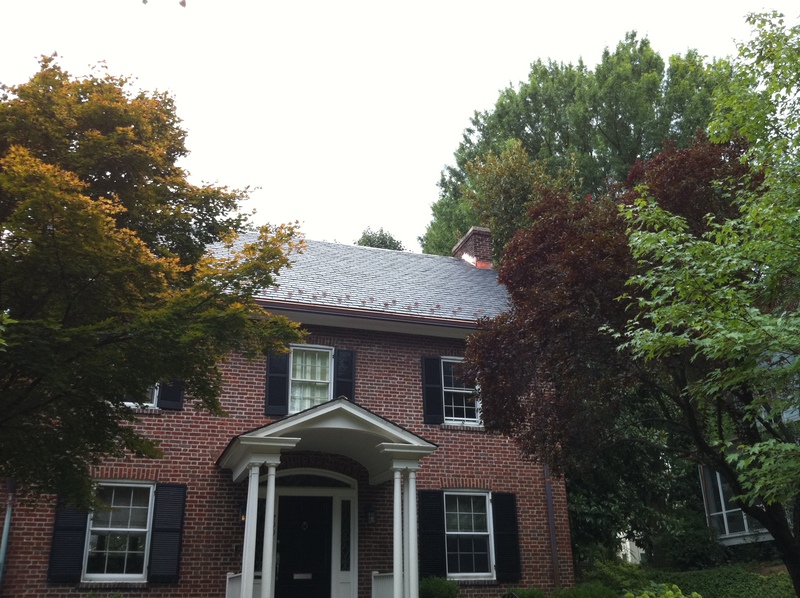 We also installed a new copper gutter on the upper main house roof. The trees cover my gorgeous roof; I’m sad to report that this is pretty much the best angle to see it. This picture was taken about a month after we finished the job, the copper is starting to turn a dark bronze color and the true deep rich color of the slate is coming through. 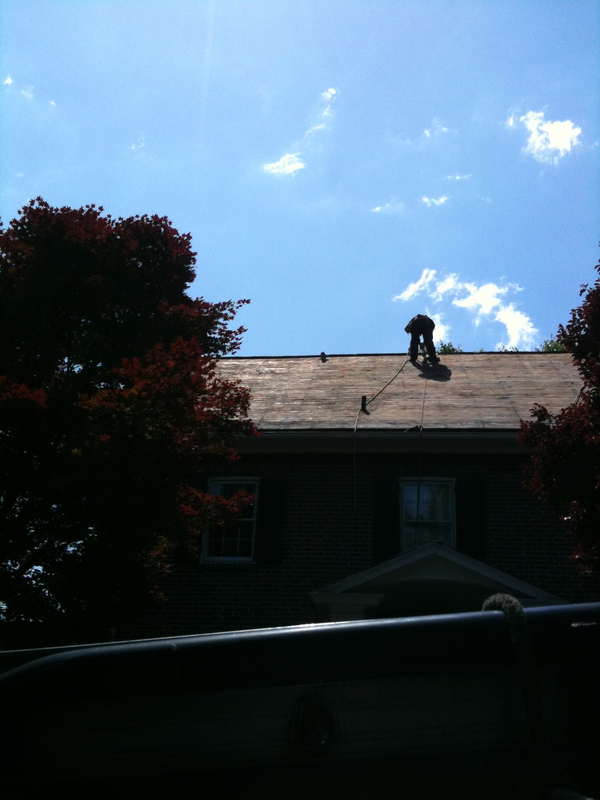 Before: this is the day before we ripped the old roof off. After: back to beautiful again. 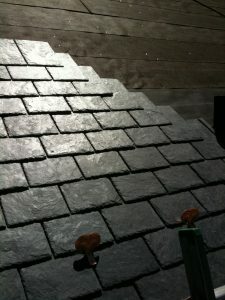 I love slate; I’d love to put it on your house, call me if you love slate too.